Cons: Taking off his 2015 season due to his injuries and personal reasons is a bit of a red flag. His body has faced a lot of trauma with a broken ankle at an early age and he also missed three games this past season due to ankle and knee issues. There are times the runner leaves his feet which causes him to take more unnecessary hits as well. Williams doesn’t pick up his feet well at the line of scrimmage which makes him subject to ankle tackles and will occasionally turn his back to the defense forcing him to leg press his way out of trouble. In the passing game, the former Cougar lets the ball into his body instead of catching the pigskin cleanly and he is not much of a pass blocker. The young runner does not set his feet and anchor, which forces him to grab sometimes at pass rushers. 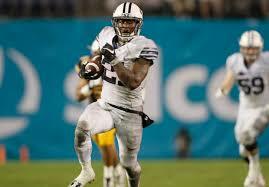 His production came in spurts with five games of 162 yards rushing or more and four games with 93 yards or less. Pros: The runner has big sprinter legs and runs well behind his pads to deliver as much punishment as he receives. This human bowling ball keeps his feet chopping, falling forward, and does well in goal line situations. He has the power to break tackles with his legs or swatting people away with his stiff-arm. Although Williams is more of a long strider, he is explosive in the open field and fends defenders away with spins, jump cuts, amazing lateral movement, and loose hips that allow him to change directions quickly. If the back gets a crease, he will ski between the obstacles (defenders) on his way to crossing the finish line (goal line). His downfield vision and balance lets him follow his blockers well and get small near the line of scrimmage. Williams plays at a high energy level and reminds me of bit of former Steeler/Cardinal Rashard Mendenhall with his foot speed and burst. Overall impressions: His stock rose up for the NFL and fantasy draft boards with a good week in Mobile, Alabama, but went back down after the NFL Combine. Remember he has a lot of injury/durability concerns, so don’t draft him before the second or third round of your rookie drafts. Williams is in my top twelve rookie running backs, but his location will determine his value much like last year’s Bears runner Jordan Howard. Thanks for reading. I will continue to discuss my scouting reports with you throughout the next week, so keep checking the site for more content. Please check out my other content as well. You can also follow me on Twitter @AndrewMiley. « WR-Cooper Kupp-Big hype, big play?